The recent Teamsters election didn't unseat the old guard's James P. Hoffa, but it left him discredited and vulnerable. Teamster general president James P. Hoffa managed to hang onto power in the recent international Teamster election — but barely. He was challenged for general president by Fred Zuckerman and the Teamsters United reform slate. Along with his running mate Tim Sylvester, the former president of New York Local 804, Zuckerman spent the last two years crisscrossing the country meeting with thousands of rank-and-file Teamsters infuriated by sell-out contracts, bankrupt pensions, and cascading corruption scandals. Besides narrowly losing the election in the United States to Zuckerman by 709 votes, Hoffa lost his “home local” 614 in Pontiac, Michigan, and Detroit Local 299, led for decades by his father Jimmy Hoffa, Sr. Hoffa eked out a win by a mere six thousand votes out of 213,000 cast in the United States and Canada in the closest election in Teamsters’ history. Today, he seems not to be wearing any clothes at all. The election results have torn to shreds the foundation of his political machine and may reduce him to a mere figurehead in the union. Hoffa was never a popular or personally admired leader. He was always more bluff and bluster than substance, aided by slick advertising funded by millions in rank-and-file workers’ campaign contributions and the union’s treasury. He relied heavily on his iconic father’s place in Teamsters history. Various attempts to create a new Hoffa cult — embarrassingly on display at this year’s Teamsters convention in Las Vegas — were embraced by the paid staff and his supporters among the many local union officers but largely ignored by the membership and even some of the officialdom. Various commentators have, in one fashion or another, characterized him as dim, but what that may reflect is that he is wary, and often inarticulate. When he strays from his stump speech, he is not a convincing talker, and he is unskilled at grappling with policy issues. Long derided by his critics as “Junior Hoffa” for being part of the long — and very much alive — tradition of many Teamsters officials passing positions of power to their children, James P. Hoffa has been general president of the Teamsters for seventeen years, making him the second-longest-serving top officer of the union in its history. While he didn’t directly inherit his office from his father, his last name gave him great prestige (even if it was tainted with gangsterism). If his last name had been Smith or Jones, he would never have had a labor career. Hoffa was sworn in as general president in March 1999 after winning the special December 1998 election, called after the federal government-sponsored witch hunt against Ron Carey, the first directly elected rank-and-file reform leader of the Teamsters. Carey earned the wrath of both the Teamster old guard — corrupt and in many cases mobbed-up officers — and corporate America for his leadership of the historic 1997 national strike against United Parcel Service (UPS). If the Carey years were a break from the Teamsters’ previous pattern of collaboration with the major employers, Hoffa was a return to the old days. Hoffa pledged that he would “build Teamster power,” as in the glory days of his father’s union in the 1950s and 1960s. But incompetence and concessions to major Teamster employers were visible in his administration from the start. For example, in October 1999, after barely seven months in office, Hoffa called an ill-advised national strike against Overnite Transportation, one of the largest nonunion freight companies in the United States. Organizing at Overnite began under Carey and some serious progress had been made, but the Teamsters were not in a position to launch a national strike. The strike quickly turned into a disaster. It was stillborn, but Hoffa refused to change course, and the strike sputtered onto an inglorious defeat two and half years later. In calling the strike, Hoffa was most likely trying to “out-Carey” Carey because of his weak position in the union. After Carey was ousted from the union, nearly 46 percent of the Teamster membership voted for reform candidate Tom Leedham and a third candidate in the special December 1998 election. The strike laid bare to anyone who had doubts about Hoffa in corporate America the fact that he was no Ron Carey. Carey had methodically and strategically planned for the 1997 national UPS strike and won a historic victory for the labor movement after two and half decades of demoralizing defeats. Hoffa recklessly gambled with the livelihood of thousands of strikers and lost. It was an inauspicious beginning to the Hoffa era. Hoffa largely consolidated his position in the early days of his administration by building a political machine easily recognizable to anyone familiar with big-city Democratic Party outfits like Chicago’s. During his first year in office, Hoffa added 137 multiple salaries — where an officer can collect several salaries for performing little work — to the Teamster payroll. While Hoffa and the old guard were hostile to democracy in the union, the 1989 consent decree forced them to build a well-funded campaign machine, running for reelection every five years and winning every one since 1998. United Parcel Service, the nation’s largest transportation company, feels that it has taken part in one of the great trades of all time in labor: James P. “Jimmy” Hoffa for Ron Carey as president of the Teamsters union. The UPS Air District Labor Manager at the facility drove [Hoffa and his entourage] around the ground and air district areas . . . Hoffa addressed assembled employees and instructed them to vote and to “make sure their vote counted.” This violation was so egregious that the election officer ruled that UPS had to grant Leedham [Hoffa’s challenger] equal access and time at Worldport. The proposed contract is a complete sellout. It gives back to UPS monumental gains that the members sacrificed for and won in 1997. In 1997 we stopped UPS from taking control of the Teamster pension plans, and we provided record increases. We made it clear that “Part-Time America Just Won’t Work.” We forced the company to create 10,000 full-time jobs by combining 20,000 part-time jobs. That achievement provided for part-timers a sense of connection, a sense of belonging to something. It gave them an opportunity for a good full-time job. And it dispelled the feeling that they were second-class citizens. That translates into a stronger union, when it’s working for all the members. This contract eliminates new full-time jobs. And it makes new, part-time jobs a disaster by freezing starting wages and cutting benefits. Hoffa’s record at UPS has been one of go-along and get-along with corporate management. In 2007 he settled early and short. He gave in to management and let them pull out from the Central States Pension Fund, crippling it; the trade-off in that deal allowed UPS freight to be Teamster-organized, but under a weaker stand-alone contract. Hoffa and Ken Hall, the Teamsters general secretary-treasurer and chief UPS negotiator, thought they were clever with their deal for a card-check organizing agreement. But Teamsters retirees and spouses and UPS freight workers got the worst of both worlds: a bankrupt pension fund and terrible, substandard contracts. In 2011 there were signs that the political situation within the union was changing. Sandy Pope was a founding member of the TDU and the president of a small Teamster local in New York when she decided to challenge Hoffa in the 2011 election. She was the first woman to run for general president of the Teamsters. Wisconsin Teamster leader Fred Gegare also challenged Hoffa for the leadership, but he was a very different rival than Pope. A previous ally of Hoffa’s, Gegare’s campaign represented an important break among Hoffa supporters in the Midwest that included Columbus, Ohio, leader Tony Jones and Fred Zuckerman, president of Louisville, Kentucky’s Local 89, one of the largest Teamster locals in the country and the home base of UPS’s global air operations, Worldport. Gegare was an old-guard figure and a longtime opponent of TDU. A coalition between the two opposing anti-Hoffa campaigns wasn’t possible in 2011. Pope and Gegare campaigns together won nearly 40 percent of the vote. Hoffa easily won the election. Pope ran a solo campaign against Hoffa. She had no running mate or slate but her results were revealing. TDU targeted thirteen local unions in New York and New Jersey. Pope campaigned and won a plurality. She also got the most votes in the seven Tennessee locals and, surprisingly, narrowly won the state. Pope did her best in national bargaining units like UPS and freight. In spite of the still overwhelmingly male composition and macho culture of national bargaining units like UPS, Sandy Pope made an impressive showing. For example, in Teamsters Local 705 in Chicago she won nearly one-third of the vote — something that most observers would have thought impossible. Hoffa hoped to humiliate his opponents in the election and pushed for the Teamster membership to vote for him in record numbers. Yet his vote fell by forty thousand votes from the 2006 election. He also lost badly in many freight locals in the Midwest. While they won the election, Hoffa and Hall didn’t seem to notice that sands were shifting under their feet. They saw the declining number of Teamsters voting as a sign that the members were happy — not that those who voted against them were enraged at their destructive leadership. Some of Hoffa’s allies even began to talk of revising the union constitution to abolish rank-and-file elections, completing the old guard counterrevolution that began when Hoffa was first elected in December 1998. Under Hoffa and Hall, UPS won big. Despite the 2008 Great Recession, UPS has made record profits each year. Yet the the Teamster national bargaining committee made fewer and fewer demands on the global logistics giant. There were also fewer numbers of full-time jobs created in each contract, and part-time wages remained incredibly low; meanwhile, UPS got one of the biggest concessions in bargaining history when Hoffa-Hall allowed them to pull out of the Central States Pension Fund — a big step towards the company’s complete control of the fund and with it much lower benefits, something that reformers in the union had long fought. UPS wanted more, and Hoffa and Hall gave it to them: Teamcare, the new inferior health care plan to UPS Teamsters. It was sold by the Teamster leadership as a purely administrative change, not a change in coverage. But it was soon discovered that coverage levels decreased for many, and wage increases and pension contributions had to be diverted to maintain previous levels. The national contract passed by a slim majority. The battle then moved to the national contract’s local supplements (mini-contracts over local working conditions), where the battle over Teamcare and issues such as the lack of substantial numbers of full-time jobs in the contract would be fought out. I started the Vote No Facebook page in May 2012 out of pure frustration when I saw the agreement. It was going to affect my health care when I planned to retire. In late June I went to the contract vote count. At the vote count I meet some of the union representatives from Fred Zuckerman’s Local 89. I was invited to the TDU convention in the fall of 2013 where I met Sandy Pope. Hoffa’s response: to use a little-known and rarely used power granted to him by the Teamster constitution to overrule the vote and unilaterally impose the contract and supplements. 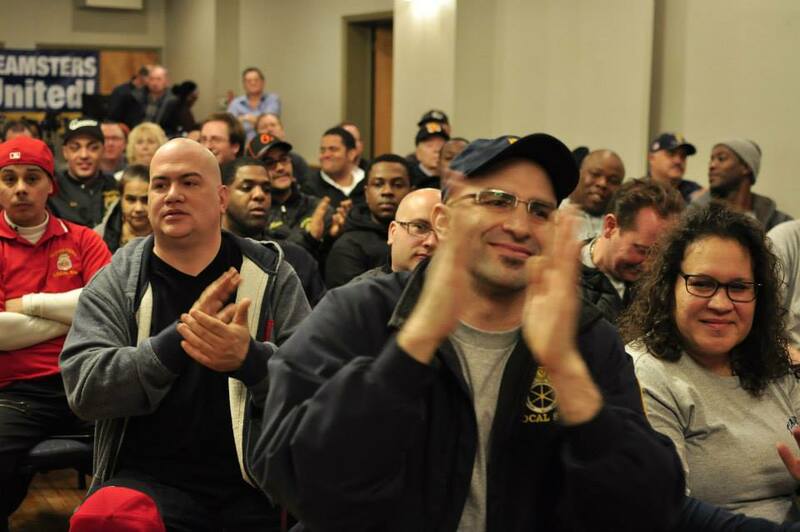 Hoffa specifically chose to impose the national contract and all supplements after Fred Zuckerman’s Local 89 voted it down by a 95 percent “no” vote. Hoffa’s arrogant display of power may have pleased UPS, but it enraged a sizeable section of the Teamster membership. At the same time, Fred Zuckerman emerged as a national leader of a movement against concessions among UPS Teamsters, carhaulers, and freight Teamsters. He also won the admiration of Teamsters retirees in temporarily halting the devastating cuts to their pension benefits. For Teamster rank-and-filers like Timlin, it made perfect sense to move from campaigning for a “no” vote to then try to unseat Hoffa: “The wheels were in motion anyway. I was asked to chair the first ‘Take Back Our Union’ meetings in Edison New Jersey, Philadelphia, and Pittsburgh in June 2014.” The 2016 campaign to unseat James P. Hoffa had begun. Looking from outside, in early 2016 it seemed foolhardy to believe a relatively small group of mostly Midwestern-based local Teamsters with little name recognition allied with the longstanding reformers of TDU would be capable of mounting a serious challenge to Hoffa’s entrenched leadership. However, for over two years prior to the vote count in November 2016, the future members of the Teamsters United slate — Fred Zuckerman, Tim Sylvester, Sandy Pope, Tony Jones, and others — toured the country meeting with thousands of Teamsters concerned about the declining state of their union. They laid the foundation of a national campaign and produced incredible results. “Fred called it,” Ken Paff told me about Zuckerman’s strategy. “If we can split the eastern region, win the South and Midwest overwhelmingly, and hold them off on the West Coast and Canada — we can win.” It nearly happened. The Midwest was key. It was here that the massive concessions in the freight industry and the impending bankruptcy of the Central States Pension Fund — where four hundred thousand retired Teamsters and their spouses will see projected 50 to 70 percent cuts in their monthly benefits — hit Hoffa the hardest. Zuckerman defeated Hoffa by over 10,700 votes in the Teamsters central region, and 2,500 votes in the South removed all of Hoffa’s six vice presidents in those regions. Chicago Joint Council 25 — known for decades for the entrenched mob presence in the Teamsters that provided many of Hoffa’s key personnel and campaign fundraisers — voted for Zuckerman and Teamsters United. Hoffa’s most powerful Midwestern vice president John Coli, one of Chicago mayor Rahm Emanuel’s most reliable supporters in the labor movement, was tossed out of office. Teamsters Local 705, which represents UPS workers at the company’s mammoth Chicago Area Consolidated Hub (CACH) voted overwhelmingly for Teamsters United. Teamsters Local 710, long identified with some of the worst old-guard corruption and stretching across three states, voted for Teamsters United. One of the new Teamsters United vice presidents will be UPS feeder driver and Teamsters Local 710 member Bob Kopystynsky, the first rank-and-file worker elected to the general executive board of the Teamsters since Ron Carey’s historic victory in 1991. Zuckerman and Teamsters United won every state in the Midwest except Michigan, where Zuckerman got 49 percent of the vote. Hoffa suffered crushing defeats in Ohio, Indiana, and Missouri. Teamsters United won Texas. Tyson Johnson, Hoffa’s freight division director, lost reelection for regional vice president and his local union vote to Zuckerman. Teamsters United candidates John Palmer of Texas and Kim Schultz of Florida won. Reformers didn’t carry the day everywhere, of course. Many local old-guard leaders like Sean O’Brien of Boston and Dan Kane of New York delivered the vote for Hoffa. The continued decline in the number of Teamsters members meant the lowest turnout in the closest election in Teamster history with a mere six thousand votes separating the winning and losing candidates. Still, the election results raise an obvious question: what does the Teamsters’ future look like? The Teamsters are the most important transportation union in North America, with 1.3 million members and located in key strategic nodes in the American economy. It is one of the three most important industrial unions, along with the UAW and the Steelworkers. The heart and guts of the Teamsters is in continental transportation networks: rail, freight, and especially UPS, the largest logistics company and unionized private-sector employer in the United States, with 250,000 union members. While Hoffa has kept the overall membership numbers steady during his seventeen years in office, his long list of betrayals, unnecessary concessions, and general neglect of the old core of the union — freight, UPS, carhaul — and lack of new organizing in the burgeoning logistics industry (notably Amazon) have significantly impacted the future of the Teamsters. It shouldn’t be a surprise, then, that all of this has finally begun to catch up with him. Yet he still holds the reigns of power on the union’s general executive board with a comfortable majority. We will know in the coming months if Zuckerman’s election protest will force a new union election, but the executive board composition will remain in Hoffa’s favor. In the meantime, the election results show clearly that Teamsters want a dramatic change in the course of their union. For the broader labor movement and left in the United States, the Teamsters’ elections should counter some of the impact of Trump’s victory and with it much inane discussion of the American working class. A befuddled Paul Krugman wrote in his most recent column, “To be honest, I don’t fully understand this resentment [that elected Trump].” Yet the states that gave Trump the presidency also voted overwhelmingly to toss out Hoffa. There is a whiff of illegitimacy to Hoffa’s reelection. Zuckerman is pursuing election protests through the Teamster election supervisor’s office, and if need be, into federal court, focusing on the Hoffa slate’s use of union resources in their campaign to cover up a corruption scandal — a major election rules violation that raises the possibility of a re-run election. The recent Teamsters election didn’t unseat the old guard’s James P. Hoffa, but it left him discredited and vulnerable.